Managing diabetes requires maintaining careful control over blood glucose (sugar) levels to prevent seizures, blindness, kidney disease and nerve damage. Glucometers test blood glucose levels so that diabetics can effectively manage their diet, exercise and treatment plan. These little machines are quite literally life savers. At ReviewLab, our team has worked hard to research glucometers that offer consistent, accurate readings. We’ve created a buying guide with key considerations such as offered features, accuracy and ease use. Read more about our methodology. This complete starter kit has everything you need lancets, lancing device, control solution, test strips and more. You get results in as little as five seconds using a tiny 0.5 microliter of blood. It’s easy to use despite having a long list of advanced features. A starter kit that includes all the supplies needed to get started right away. The testing strips come at a reasonable price. Plus, the instructions are easy to follow for those who’ve never used a glucometer before. 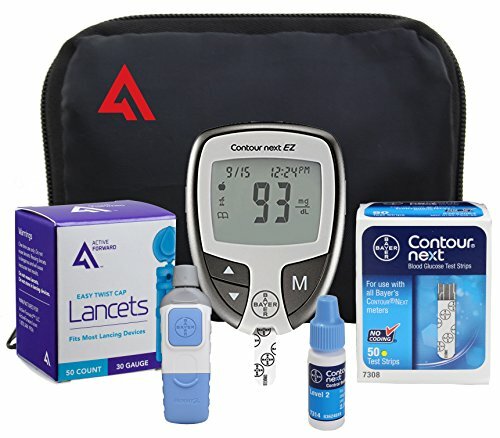 This is an easy to use glucometer that comes with a few testing supplies and offers some advanced features. Reliable results at an affordable price make this glucometer one worth considering if you’re on a budget. A full kit that won’t break the bank. This easy to use glucometer is small and provides results in as little as five seconds. A small 0.5 microliters blood sample still provides accurate readings. 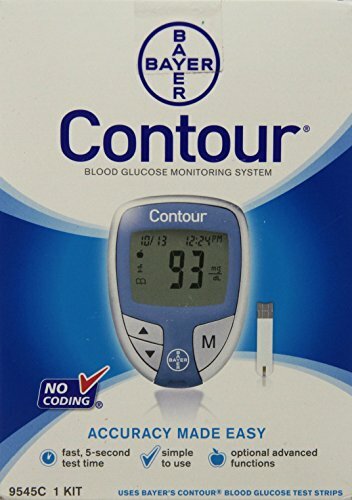 The glucometer stores an impressive amount of readings for a glucometer at this price. With an audible voice that’s loud, clear and easy to understand and a large digital display, this is a great glucometer for the visually impaired. It’s simple and easy to use. The testing supplies also come at a reasonable price. 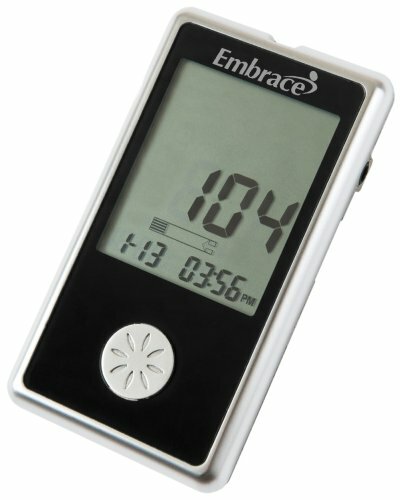 The audible feature on this glucometer can be turned on and off as well as use English or Spanish. Other than the audible feature, this a very basic glucometer that uses a small sample size and offers consistent readings. 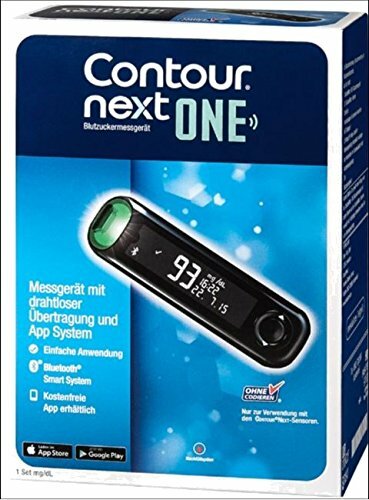 A small glucometer that’s loaded with features, the Contour Next One lets you monitor your readings through an app on your smartphone or tablet. It can also connect to a computer with a USB cable to download readings. Despite its small size, the Prodigy Pocket can store 120 test results and offers 7, 14 or 30-day averages. It gives reliable readings and there’s no coding necessary which cuts down on errors. Glucometers must be calibrated to each new batch of test strips, but how this is done can vary by model. Automatic coding can make the process easier. Proper calibration can be done through several different methods, including the use of a removable code chip that must have the code manually entered, or by using a downloadable app that allows you to scan the code with a smartphone. Which method works best for you will depend on how comfortable you are working with technology, but if you code incorrectly you can get inaccurate results. Some glucometers have internal memory that stores test results. There is a wide range of storage capacity available from those models that have no internal memory to some that can store over 3,000 test results. Other models also track and store the average of your daily readings. Most glucometers with this feature create averages for the last 7, 14 or 30 days of test results. There are a few glucometers that allow you to mark whether or not the reading was taken before or after a meal. The more often you check your blood sugar the more important the data storage features become. A few seconds may not sound like a long time, but if you frequently test your blood sugar throughout the day, short test times become important. In general, a testing time of five seconds or less makes the process faster for most people. You’ll spend far more money on test strips than you do on a glucometer. Each glucometer model requires a specific type of test strip, and the cost of those strips varies. Be sure to check the price of test strips and other testing supplies that are required before purchasing. Modern technology has greatly reduced the amount of blood needed to get an accurate reading. Still, if lancing is difficult for you, look for a glucometer that uses less than one microliter of blood. Glucometer prices can be deceiving. A relatively inexpensive model may use test strips that are expensive. For less than $15, you can find a glucometer that does not include testing supplies. Many have before and after meal markers as well as enough memory for 360 readings. In the $15-$50 range are both standard and compact glucometers that come alone or as part of a kit. Kits may include a case, lancets, lancing device and test strips. These models may include features like daily averages, more data storage, and before and after meal markers. At $50 and up, you’ll find kits that include a higher number of testing supplies, Bluetooth capability and/or higher memory capacity. The Contour Next EZ has relatively inexpensive test strips that make it a great choice if you want to save on supplies. Even better, it’s easy to operate straight out of the box. Bayer has eliminated the need for coding of any kind, which takes one step out of the testing process. You can track both pre-and post- meal results with averages every 7, 14 and 30-days. You can save on test strips with the Second Chace feature that lets you add more blood to a test strip if it doesn’t have enough for an accurate reading. Inexpensive test strips save money. The test strips used for this glucometer are relatively inexpensive saving you money in the long run. Many users switched to this meter specifically for that reason alone. Simple to operate right out of the box. This kit comes ready for you take readings right away. There’s no coding necessary, eliminating an entire step in the process. Several users liked that all the advanced features on this glucometer are optional. You can use them or you don’t have to. Either way, you get quick, accurate results. Available advanced features. It has tracking features that let you review your glucose levels pre-and post-meal in 7, 14 and 30-day averages. You can also set an alarm to remind you to test. It lets you know if your results are landing in your target range and provides a summary of your results. The best part, all these features can be turned off if you want. Versatile sampling options that save testing strips. A unique feature of this glucometer is the Sip-In and Second Chance sampling. You can use Sip-In for the smallest volume of blood, but if you don’t get a good reading you can apply more blood to the same test strip with the Second Chance feature. Adjustable strike depth of the lancing device. You can adjust the strike depth of the lancing device, which can cut down on discomfort. Many users liked being able to adjust the depth according to their personal pain threshold level. Packaging errors. A few users experienced packaging errors where they didn’t receive some of the supplies included in the kit. Sometimes it was the test strips while others received lancets that weren’t compatible with the lancing device. If you want to start testing right away, this all-inclusive kit has easy to follow instructions that make it usable right out of the box. It includes everything you need like test strips, lancets, lancing device, alcohol pads, carrying case and a logbook. Testing supplies for this glucometer are reasonably priced and readily available. A small 0.5 microliter blood sample is enough to get accurate results. You can adjust the depth of the lancing device as well. All-inclusive kit that can be used right out of the box. Test strips, lancets, lancing device, alcohol pads and a carrying case are only a few of the included items with this kit. Many users were able to start using this glucometer within a few minutes of opening the box. Price and availability of the testing supplies. The testing supplies used with this glucometer are relatively inexpensive. Several users switched to this glucometer based on the affordable price of the test strips. Accurate results with a small blood sample. The glucometer only requires 0.5 microliters for an accurate reading. Users sensitive to the lancing process appreciate the small sample size necessary. Easy to follow instructions. Ease-of-use was increased by clear, easy to follow instructions included with the kit. A small percentage of units with inconsistent readings. A few users experienced inconsistent readings and returned the glucometer. 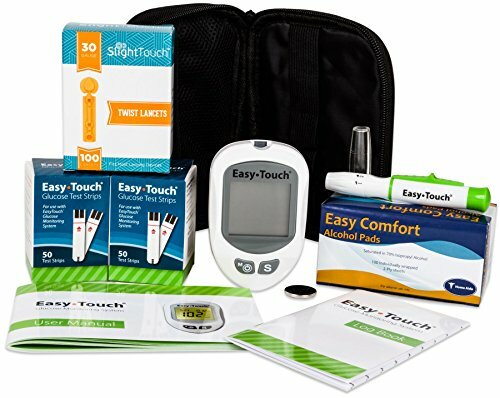 This affordably priced glucometer comes with a few test supplies to get you started. However, you will need to order more supplies soon after purchase. It offers accurate results that are comparable with lab tests, allowing users to have better control over their blood sugar. It comes with good data storage, recording 480 readings and providing 14-day averages. You can also mark readings as either pre-or post-meal to better see patterns in blood sugar levels. Affordably priced to get started. While this glucometer does not come with an extensive set of testing supplies, it does include enough to get you started. Most users appreciate the affordable price and ability to get started right away. Results comparable to lab tests. Accurate results are key to successfully monitoring blood sugar. When users compare the results they get with the Bayer Contour with those they receive in the lab, they have found them to be accurate. Memory and marking ability. This glucometer has enough memory for 480 readings and a 14-day average. You can mark readings as pre-or post-meal. Many users like being able to use the glucometer to see how food directly affects their results. Incomplete order upon arrival. A few users only received the glucometer and none of the other supplies needed for immediate use. This full kit won’t break the bank and offers enough testing supplies to get you started right away. It’s small enough to fit in the palm of your hand, making it highly portable. For those who are sensitive to the lancing process, it requires a small blood sample size of 0.5 microliters. This glucometer offers accurate readings from alternate test sites as well. For the price, it offers a good amount of memory and some advanced features such as 7, 14 or 30-day averages that give you a better overview of your health. Small glucometer that fits in the palm of your hand. This meter easily fits in the palm of your hand. Many users like the portability that the small size offered. Accurate readings with a small blood sample size. The small blood sample size made it a user favorite. Those who are sensitive to the lancing process appreciate the ease of getting a sample. Offers alternate site testing. Blood can be taken from alternate testing sites when your fingers need a break. Memory capacity and versatility of results. 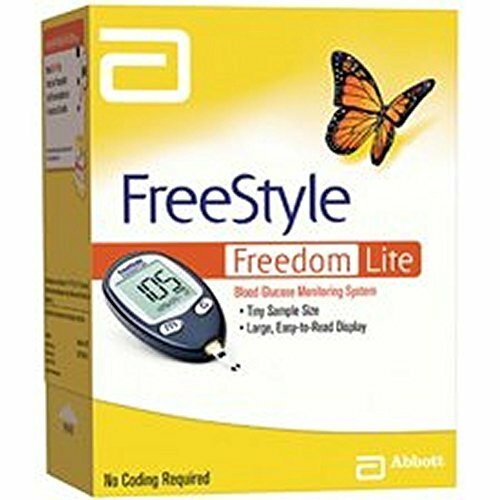 The FreeStyle stores up to 400 results, each marked with the dates and time. Those results can be averaged in 7, 14 or 30-day intervals. Test strips can be pricey. The test strips for this kit can be expensive. For those with limited or declining eyesight, a glucometer with audible readout can make testing much easier. Audible readout also works well if you have to take readings in the dark. Some models play all readouts audibly while others allow you to turn the feature on or off. Most models with an audible readout feature also have large digital displays with high contrast for better visibility. The audible readout with the Prodigy is clear, loud and easy to understand. When coupled with a large digital display, this glucometer provides the features that make it ideal for the visually impaired. It requires a small blood sample size and offers alternate site testing on the forearm, upper arm, calf, hand and finger. The glucometer is affordably priced and replacement testing supplies can be found are inexpensive, especially when ordered in larger quantities. Loud, clear voice for all readings. Many users with impaired vision liked the quality of the audible readout. Older users needed the extra volume to clearly hear their readings. Ease of alternate site testing. Blood samples can be taken from the forearm, upper arm, thigh, calf, hand or finger. Users sensitive to the lancing process appreciated having lots of site options. Large, easy to read digital display. The digital display is large for a glucometer of this size. Several users with visual impairment report that the large digital display along with the audible readout made this glucometer much easier to use. Instructions can be difficult to download. Some users had problems downloading the instructions online because of software compatibility issues. The audible readout options with the Embrace make it a good choice for the visually impaired on a tight budget. Readouts can be given in English or Spanish, and you have the option of turning the voice off altogether if needed. A simple, lightweight design keeps the price of this glucometer affordable, but testing supplies will need to be purchased separately. The features with this unit are few but that means the functions it does have work well. Audible feature with options. The audible readout option can be turned on or off. All readouts, including input instructions, can be done in either English or Spanish. Affordable price for a simple glucometer. Many users were looking for an affordable glucometer and the Embrace perfectly fit their needs. This simple glucometer works well as a primary glucometer or as a backup device for use away from home. Simple, lightweight design. The Embrace focuses on simplicity rather than extra features. The audible readout option is really its only advanced feature, but that’s all many people need. Small percentage of units gave inaccurate readings. A few users got a glucometer that reported high numbers. Glucometers with wireless capabilities use Bluetooth technology to connect to a downloadable app on a smartphone or iPad. All readings and data can then be displayed on various charts and graphs. Some apps create reports that can be used to send readout information to a physician. 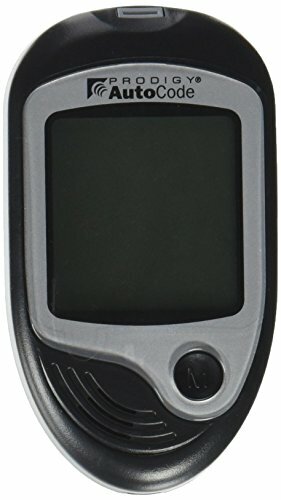 However, glucometer with wireless capabilities are still new to the market and some have had problems connecting with apps. The glucometers still take accurate readings but syncing that information with the app or other software tends to be problematic. If you are choosing a glucometer only because of its wireless capabilities, be sure it is also highly rated for accurate readings. The downloadable app lets users easily track blood sugar information without having to write anything down. All readings are automatically synced to the app where they are organized into printable charts. The app can also be used as a logbook to track additional information that may affect blood sugar like meals, medication and exercise. You can save money on test strips with the Second Chance technology that gives you 60 seconds to add more blood to an already used test strip. Overall, this glucometer offers fast, accurate results. Works well with the downloadable app. It quickly connects to the app using Bluetooth. Many users like being able to see their results on their phone where averages and trends are easy to spot. App can be used as a logbook. You have the option of using the app for logging meals, medications, exercise, notes or attach photos. Saving that information in app allows users to see how their behavior directly affects blood sugar. Second chance technology saves money. If you don’t have enough blood on the test strip for an accurate reading, you have 60 seconds to add more blood. Many users like found they waste fewer test strips with this feature. Fast, accurate readings. Accurate readings are the most important feature, and the Contour Next One is reliable. App setup can be difficult. Once the app is set up, it works well, but for some users it was tough to get to that point. Whether you frequently travel for business or pleasure, a compact glucometer can make checking your blood sugar easier. Most glucometers can easily be held in the palm of your hand, but compact models are even smaller. Most are about three-quarters of an inch wide and three to four inches long, making them easy to carry in a purse, briefcase, backpack or pocket. There are a few compact models that are also wireless, but be sure to check how well they work with their included apps. When they call it a pocket glucometer, they aren’t joking. The small size makes this model highly portable for travel or for a backup glucometer to keep at work or school. A small 0.5 microliter blood sample is all it takes to get accurate readings. Up to 120 of those readings can be recorded for tracking overall glucose patterns. It also offers 7, 14 or 30-day blood sugar averages. Small size makes it highly portable. The small size and design let the glucometer fit in your pocket. Several users kept this glucometer exclusively for travel or a backup because of the size. Consistently accurate readings with a small blood sample size. Consistent readings with a small blood sample size mean less lancing. Many users like that the readings took such a small amount of blood. 120 readings worth of memory for data tracking. Even though it’s small, it still comes with a good amount of data storage. Users can track their information and look for patterns with this feature. Glitchy computer software. This glucometer can use a USB cable to download readings to a laptop. However, many users had problems with the software. No testing supplies included. All testing supplies must be purchased separately.